Things are starting to slow down here on the farm. Hay season is over. All the small square hay bales are tucked away in the hay shed out of the weather. Most of the big round hay bales are stacked in rows. We only have two more paddock empty of round bales. The weather is getting warmer and the grass is getting drier. This is okay as our cattle grow really well on dry feed. Our summer fruits are beginning to ripen. The Apricots are starting to turn orange. These are late this year. 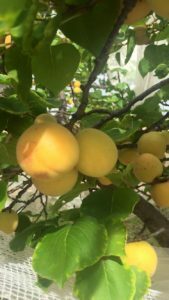 Normally the Apricots are ripe at the start of December. The Plumcots are also ripe now. Plumcots are a cross between a Plum and an Apricot. If you haven’t tried these before I recommend it! Christmas is only 10 days away. Can you believe it? We will only be opening our shop on Fridays for the Christmas period. So this Saturday is the last Saturday we are open for the next few weeks. At the start of next week we are getting another animal back from the butchers. So this means we will have most cuts of beef back in stock again. It is time to finalise your Christmas orders. We are offering free delivery for all orders over $100. The cut off for delivery is next Friday 23rd December. We have a wide range of Christmas roasts available as well as all your BBQ needs. So why not WOW your Christmas guests with some LOCAL, HEALTHY beef this Christmas.